At Niagara Peninsula Orthodontics, we strive to provide high quality orthodontic treatment while maintaining a fun, friendly, and welcoming office environment for our patients. While we enjoy every part of the orthodontic treatment process, we know that for our patients, there's one aspect that's better than any other - finishing up with braces! We've seen it all too many times – the look of sheer joy, the near bouncing off the walls, and the general excitement that come with finally getting braces taken off. While we know you'll be ecstatic once you get your braces off, you're not quite out of the woods yet – now comes the retention phase of your treatment, and it's one of the most important parts of cementing your new smile. While your teeth will be in new positions at the end of treatment, the ligaments and tissues that support them won't have adapted to their new positions yet. This means that without a retainer, your teeth will just migrate back to their old positions, erasing all your hard work! Wearing your retainer ensures that your teeth settle into their new alignment, securing your beautiful new smile for years to come. We're proud to offer three kinds of retainers for our patients, and we'll work with you to select the one that best fits your needs. 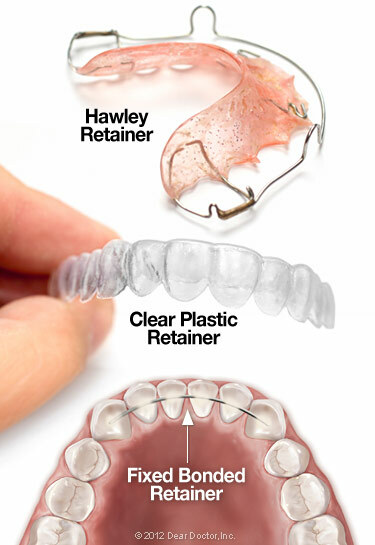 Hawley: The Hawley retainer is made from a thin piece of acrylic custom manufactured to fit the roof of your mouth and a metal wire that wraps around your teeth. It's removable, comfortable, and can even be adjusted to correct any minor tooth movements that occur after your braces come off, making it a very effective all-around choice. Clear Aligner: Clear retainers are very similar to Invisalign aligners, made from a thin, transparent piece of plastic that's form-fitted around your dental arch. These retainers are invisible, making them convenient for daytime wear, but they're also somewhat less durable than Hawleys. Fixed: A fixed, or bonded retainer, is essentially just a thin metal wire that's cemented to the lower canines. It can't be removed, which means it's impossible to lose, and it's also connected to the inside of the teeth, so it's impossible to see from the outside. This is a great option for patients who need extra support for ensuring that teeth don't move back to told positions. At first, you'll likely need to wear your retainer full time. During this period, it's normal to salivate more than usual - a response to the foreign object in your mouth - and experience slight difficulty in speaking, but both of these issues will fade quickly. After some time, we'll have you wear it only at night, then eventually only a few nights a week. It's imperative that you clean your retainer regularly to avoid plaque buildup and tooth decay. You can brush a Hawley or bonded retainer, but it's best to use denture cleaning tablets on a clear aligner, as brushes can scratch them. We'll give you detailed wear and care instructions when we fit you with a retainer. Have more questions about wearing your retainer? We're happy to help. feel free to reach out to us at our contact page or use our easy online form to schedule an appointment at our Niagara Falls or St. Catharines, ON office. We can't wait to hear from you, and we look forward to helping you achieve a beautiful, healthy new smile!